President Abdulla Yameen has assured the public that authorising foreign ownership of land or freeholds in the Maldives will not threat Indian Ocean security or lead to “enslavement” and shortage of land. Addressing the nation this afternoon after ratifying amendments to the constitution passed by the parliament yesterday, Yameen insisted that the unprecedented changes will not adversely affect “friendly relations” with South Asian neighbours. “The Maldivian government has given assurances to the Indian government and our neighbouring countries as well to keep the Indian Ocean a demilitarised zone,” he said. The amendments will allow foreigners who invest more than US$1 billion to own plots of land within the project site. At least 70 percent of the project site must also be reclaimed land. The second amendment to the 2008 constitution was approved yesterday with 70 votes in favour and 14 against. MPs opposed to the move expressed concern over possible Chinese military expansion in the Maldives and lack of time to debate the amendments. Attorney General Mohamed Anil stressed that the government will conduct background checks on investors and review if proposed projects may affect geopolitics. The amendments include “safeguards” such as a requirement for the parliament to approve the projects, Yameen said, and investors will not be able to carry out any other work apart from the authorised project. The state will exercise complete sovereignty over the areas, he continued, which would also be subject to the Maldivian constitution and laws. “If the Maldivian state’s sovereign authority is not lost, temples can’t be built there, casinos can’t be built there, and illegal activities cannot be carried out,” he said. Anil meanwhile noted that the amendments state that the total land area of all project sites must not exceed 10 percent of naturally existing land in the Maldives. The projects will also be regulated by laws passed by the People’s Majlis, he added. Anil said freehold zones were key in the economic transformation of Dubai, Singapore, and Saudi Arabia. He also said India has a threshold of US$5 million worth of investment. “The government is not obliged to engage with investors who come with US$1 billion. Of the proposed projects, we will check how feasible they are, what the biggest investments are. And we will also check who the parties are, what their backgrounds are, for Maldives’ security and protection, if this will affect geopolitics,” he said. The US$1 billion will not be spent entirely on land reclamation, Yameen said, but on infrastructure development such as new “townships,” airports, marinas, and seaports. Adeeb meanwhile told the press that the amendments were in line with the ruling Progressive Party of Maldives’ (PPM) economic agenda. It accompanies the government’s flagship special economic zones (SEZ) legislation and the introduction of corporate residence visas. Responding to allegations that the SEZ legislation had failed, Adeeb said the government has received several SEZ proposals from potential investors, but the government could not accept some as some investors made demands such as complete exclusivity for 25 years. The government is negotiating “the best deal” for the country and seeking “win-win situations”, Adeeb said, reiterating that one ‘mega project’ could transform the economy. The government will not allow illegal activities such as weapons smuggling, money laundering, or gambling, he said. “We do not want to bring in companies with bad reputations to launder money. We are talking about Fortune 500 companies,” he said. The government is not planning on offering all the islands and lagoons in the Maldives for sale, he said, adding that the government will only authorise “one or two projects” that would create jobs for youth and increase national wealth. The Maldives has the capacity to significantly increase its territory by reclaiming land in large shallow lagoons, he said, and the cabinet’s economic council has approved funds for the state-owned Maldives Transport and Contracting Company (MTCC) to procure a cutter dredger. Yameen said 24 million square meters of land could be reclaimed from the lagoon of Laamu Maavah for about US$200 million, 45 million square meters could be reclaimed from the Vaavu Bodumohora lagoon for about US$160 million, and 16 million square meters could be reclaimed from the Thaa Hirilandhoo lagoon for US$50 million. Once the MTCC dredger arrives next years, Yameen said the government will have the capacity and the financial means to carry out the projects. There is no danger of running out of land in the next 50 or 100 years, he said. Population consolidation is also a policy of the current administration, Yameen continued, urging youth from small islands to migrate to the capital. Once phase two of the Hulhumalé development is complete and the government authorises high-rise buildings to 20 or 25 floors, Yameen said up to 70 percent of Maldivian population could be settled in the Malé region. 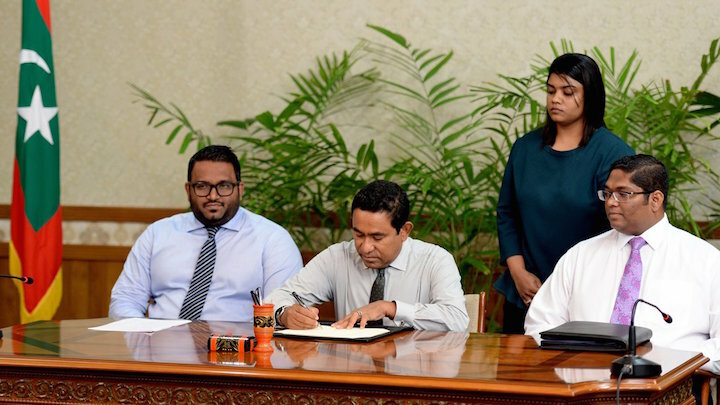 Yameen said the constitutional amendments were proposed following long deliberation, research, and consultation with foreign parties and legal experts. The Government has proposed an anti-Piracy bill in an effort to curb rising concerns over the issue of security within its territorial waters and the wider Indian Ocean. The bill has been presented to parliament by government-aligned Jumhoree Party (JP) Leader and business tycoon Gasim Ibrahim. The stated purpose of the bill is to establish a legal framework to deal with piracy within the territorial waters of the Maldives amidst concerns at the growing risk of maritime crime in the Indian Ocean over the last few years. With the Maldives located at a strategic intersection of sea trade routes, a significant amount of global maritime traffic passes through or near the country’s northern atolls. The bill also seeks to outline legal procedures to deal with individuals suspected of committing acts of piracy within Maldivian territorial waters. such procedures do not presently exist in the country’s legal system. The acts outlined in the proposed bill would be considered as criminal offences. According to the bill, a person who is found guilty of an act of piracy would face a 25 year jail sentence. Meanwhile, if a suspect was found guilty of killing a person during a suspected pirate attack, they would be punished under Islamic Sharia to an additional 30 year custodial sentence. For any damage to property incurred through piracy, a punishment of 15 year imprisonment is prescribed. Those found guilty of conspiring to commit or assist in acts of piracy in the Maldives would face a punishment of 10 years imprisonment, according to the bill. The bill specifically describes armed robbery as a separate offence, whereby if found guilty, a person would receive a 30-year prison sentence. In a case where someone was killed during a suspected armed robbery, the suspect would face imprisonment along with additional punishment outlined in Islamic Sharia. According to article 4 of the bill, the state authorities are vested with the power to apprehend offenders in its territorial sea, the contiguous zone, the exclusive economic zone and International waters. The United Nations Convention on the Law of the Sea defines a state’s territorial waters as extending up to 12 nautical miles from its baseline. The contiguous zone is a band of water extending from the outer edge of the territorial sea to up to 24 nautical miles (44 kilometres) from the baseline, within which a state can exert limited control. An Exclusive Economic Zone (EEZ) of a state extends from the outer limit of the territorial sea to a maximum of 200 nautical miles (370.4 kilometres) from the territorial sea baseline including the contiguous zone, according to the same conventions. Other offences noted in the bill includes the hijacking of vessels. The punishment outlined for such a crime is 10 years imprisonment and a fine between MVR 100,000 to MVR 1 million. Meanwhile, the punishment for obstruction of a safe passage is imprisonment for a period of no more than 15 years. Courts in the country would also be allowed to extend the detention period of arrested individuals through means of audio and video phone in cases where it proved difficult to bring a suspect to a hearing, under provisions in the bill. The power to arrest would also be vested to both the Maldives National Defence Force (MNDF) and the Maldives Police Services in the case of suspected acts of piracy. However, hearings of all offences committed under the bill would be tried at the Criminal Court in Male’. Speaking to Minivan News, Foreign Ministry Spokesperson Ibrahm Muaz Ali said that the government had continued to raise concerns over security in the Indian Ocean for some times and had built strong relations with neighbouring countries like India to combat potential pirate attacks. According to Muaz, the anti-piracy bill was perceived by the government as being a necessity in order to establish a framework capable of dealing with the issue. He added that the government was getting support from all regional countries on the matter. Back in April last year in an interview given to the India-based Daily News and Analysis publication, Minister of Defence Mohamed Nazim highlighted the government’s concerns regarding the potential for pirate attacks. The comments were made at the same time that the first ever tri-lateral naval exercises between Sri Lanka, India, and the Maldives were held. Nazim told the paper that he believed a united approach was the best way to combat the problems of piracy in the Indian Ocean. Nazim also praised the Indian Military for its assistance in equipping and training the Maldivian National Defence Force (MNDF). The Maldives experienced the first confirmed case of piracy within its waters back in March 2012, when a Bolivian-flagged vessel headed for Iran was hijacked by Somali pirates. The vessel was released a few days later. MNDF Spokesperson Colonel Abdul Raheem at the time confirmed that the vessel was hijacked about 190 nautical miles Northwest of Hoarafushi island in Haa Alif Atoll. The vessel was identified on Somalia Report as the Iranian-owned MV EGLANTINE, with 23 crew members on board. The vessel, which has previously been named the Bluebell and the Iran Gilan, is owned by Darya Hafiz Shipping. The Maldives’ government first expressed concern over the growing piracy threat in 2010 after small vessels containing Somali nationals began washing up on local islands. The castaways were given medical treatment and incarcerated while the government negotiated their repatriation. In March 2012, 40 Somali castaways in the custody of Maldives authorities refused to return home despite arrangements that were made for their safe repatriation. The government had at the time identified and obtained passports for the detainees and arranged a charter flight for their return to Somalia, confirmed a senior government official who worked on the case. However, the source claimed that the government was unable to deport the foreign nationals against their will. Refugees cannot be repatriated without consent under international conventions to which the Maldives is signatory, leaving the Maldives no legal recourse but to sign international conventions on the rights of refugees and migrant workers and their families and accept the Somali nationals as refugees. In a special report on piracy in December 2010, Minivan News cited a European piracy expert who noted that increased policing of waters at a high risk of piracy was forcing pirates deeper and deeper into the Indian Ocean. “We believe that this trend is due to the fact that the pirates are following the vessels – as merchant ships increase their distance from Somalia in order to feel ‘safer’, the pirates follow them resulting in attacks much farther east than ever before,” the expert said at the time. An American luxury passenger line en route to the Seychelles in January was stranded in the Maldivian waters due to an alleged “piracy risk”, while the passengers departed to the Seychelles through airline flights. Secretary General of Maldives Association of Yacht Agents (MAYA), Mohamed Ali, told Minivan News at the time that the passenger line had arrived on December 29 and was scheduled to leave the same day after a brief stop near Male’. However, he said the cruise captain had decided not to leave with the passengers on board due to “security reasons”, as there have been several attacks by pirates near the Seychelles. According to the government, the proposed bill if passed would pave way to deal with the matter easily and efficiently.